The Isle of Skye is the largest of the Inner Hebrides with the busy town of Portree as its capital. Skye can be reached by ferry from Mallaig to Armadale within 30 minutes or over the 700 meters long Skye bridge from Kyle of Lochalsh to Kyleakin. The Skye Bridge is a road bridge over Loch Alsh, connecting mainland Highland with the Isle of Skye. The shortest crossing between the mainland and the island (around 500 metres), the sound between the villages of Kyle of Lochalsh on the mainland and Kyleakin on the island’s east coast has traditionally been the most common route. A ferry operated services run by a number of private operators and until recently by Calmac. Being connected by bridge can be reason for discussion whether we have to consider Skye as being an island since it is now attached to the mainland. On this website we consider Skye as one of the islands in the Inner Hebrides as well as part of the Highland region. The Cuillins mountain range dominates much of the sky(e)line with its many sharp peaks of which Sgurr Alasdair, 993 meters, is the highest. The slopes of the Cuillin are very steep and only suitable for the more experienced climber. From Sligachan the view on the Cuillin Hills are spectacular and the same dramatic views can be obtained from the Morar peninsula. In addition to climbing individual peaks, there is the challenge of a full traverse of the ridge. Although only seven miles in length, the average traverse is likely to take 15-20 hours from sea level at Glenbrittle to the bar of the Sligachan Hotel owing to the difficulty of the terrain and route finding problems. Some believe the ultimate mountaineering experience of the UK is the full traverse under winter conditions. The Isle of Skye’s position in the warm Gulf Stream makes genuine winter conditions rare, and the very short winter days probably make a 24-hour traverse impractical. The Cuillin is perhaps the only range in the United Kingdom to approach in sheer jagged rawness (though not of course in height) the mountain experience of such ranges as the Alps or Rockies. 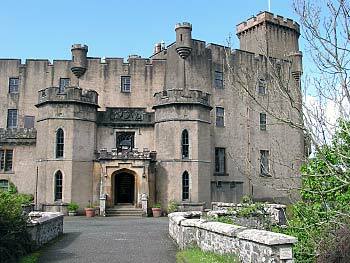 seen to visitors such as Sir Walter Scott, Queen Elizabeth II and the Japanese Emperor Akihito. The gardens are well worth a visit but the best preserved gem in this castle is without a doubt the “Fairy Flag.” The Fairy Flag is known for the numerous traditions of fairies, and magical properties associated with it. The silk of the flag has been stated to have originated in the Far East, and was therefore extremely precious, which led some to believe that the flag may have been an important relic of some sort. There are numerous traditions and stories associated with the flag, most of which deal with its magical properties and mysterious origins. The flag is said to have originated as: a gift from the fairies to an infant chieftain; a gift to a chief from a departing fairy-lover; a reward for defeating an evil spirit; or as a banner from the Holy Land. The various powers attributed to the Fairy Flag include: the ability to multiply a clan’s military forces; the ability to save the lives of certain clanfolk; the ability to cure a plague on cattle; the ability to increase the chances of fertility; and the ability to bring herring into the loch at Dunvegan. Some traditions relate that if the flag were to be unfurled and waved more than three times, it would either vanish, or lose its powers forever. 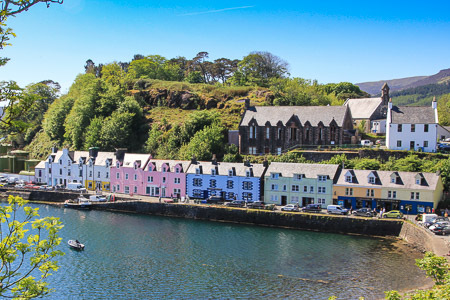 Set round a natural harbour, Portree is the main town on Skye and an important and busy centre, with many shops shops and leisure facilities, including a swimming pool, pony-trekking and boat cruises. It is very much a cultural focus for the island and the Aros Centre at the south end of the town has a programme of concerts, theatre and cinema, as well as an exhibition about the environment of Skye and Lochalsh and an RSPB exhibit with nest cameras for the rare sea-eagles. Until 2017 Talisker was the only malt whisky distillery on the Isle of Skye, located near Carbost in a Gaelic speaking area at loch Harport. The distillery was founded in 1830 by Hugh and Kenneth MacAskill, and built in 1831 at Carbourn after a number of false starts on other sites when they acquired the lease of Talisker House from the MacLeod of MacLeod. The distillery was rebuilt 1880-87 and extended in 1900. During this early period, the whisky was produced using a triple distilling method, but changed to the more conventional double distilling in 1928. 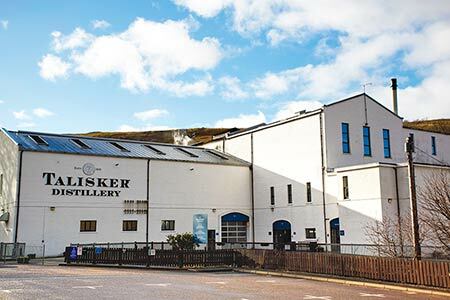 Talisker was acquired by Distillers Company Limited in 1925 and is now part of Diageo. It was rebuilt in 1960 after a stillhouse fire completely destroyed the distillery. The new Distillery at Torabhaig is the second ever licenced Single Malt Scotch Whisky distillery on the Isle of Skye. The distillery has been a fully operational since January 2017.